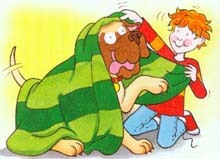 Puppy Mudge loves his blanket, but it's nowhere to be found. How will he take his nap without it? In these pre-level one books, the big, drooly dog from the best-selling Henry and Mudge series is a puppy, and his adventures with his beloved friend Henry are playful and simple - perfect for just-beginning readers! Puppy Mudge loves his blanket, but it's nowhere to be found. How will he take his nap without it?